We have a new reviewer tonight - mintoncard! 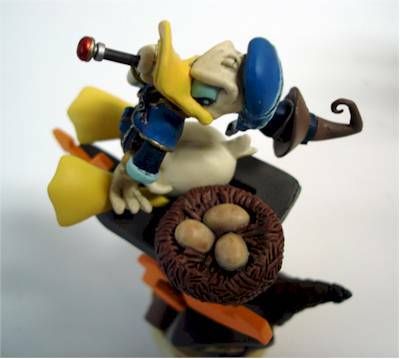 He's here with a great review of the Disney Kingdom Hearts figures. Tell us all about them, MOC! As fans of both Disney and Final Fantasy know, the SquareEnix game Kingdom Hearts II will be hitting stores on March 29th. The first Kingdom Hearts was a successful PS2 game both here and in Japan. Part II was just released in Japan and became the #1 selling game in just 3 days. For those who haven't played KH1, the game involves characters from different Final Fantasy games as well as many popular characters from Disney animated features. Along with some original new main characters, the game had a great plot, stunning visuals and fantastic action. To my knowledge, only one company made action figures from this game back in 2004. Mirage/Toycom released two series of double-pack figures that were quite good. Each pack featured two characters: a Disney character and a human (Final Fantasy type) character. 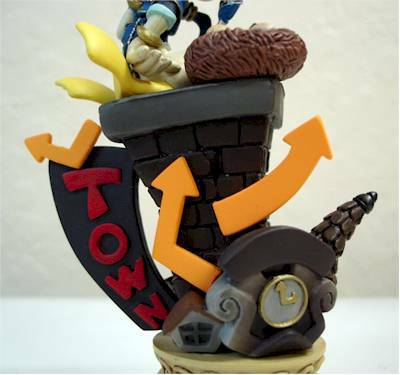 But other than that series, there haven't been any other KH toys in the US. Until now! 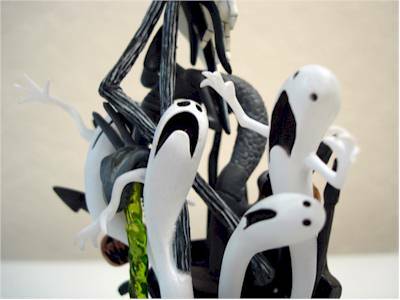 Collectible "trading figures" in blind boxes (you don't know what figure is inside until you open it) are VERY popular in Japan. There are trading figures for just about ANYTHING you can imagine. From miniature video game replicas to Batman statues. If it's part of pop-culture, there is probably a trading figure for it. 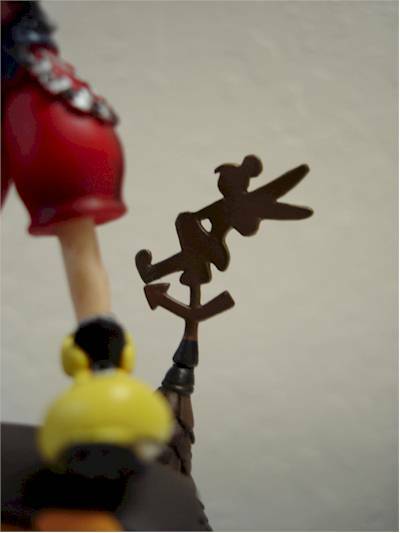 Last year, Formation Arts released a series of blind boxed "mini-statues" from Kingdom Hearts. 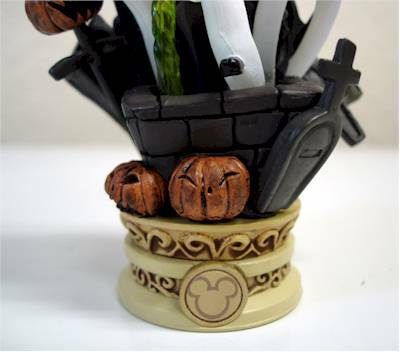 There were six: Sora, Donald Duck, Jack Skellington, Maleficent, Hades or Shadow. Now, Diamond Comics has released Sora, Donald & Jack on blister cards in the US. The packaging shows off the statue quite well. The dark background with the yellow moon/heart really spotlights the character. The packaging is not collector friendly. Both Sora and Donald only had ONE twist-tie holding them in. 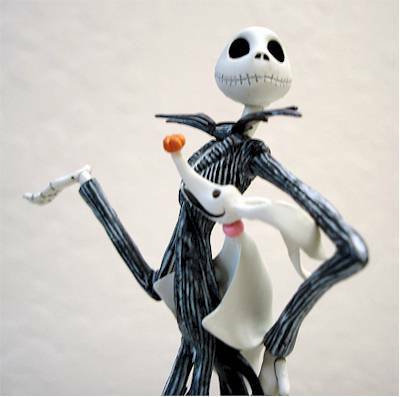 Jack had TWO. Considering these figures used to be sold in blind-boxes, I found this new packaging retained the theme of the original game style. The sculpting on these little statues is amazing. The smallest details are well defined in each figure. 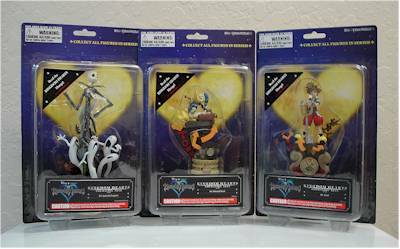 From the Tinkerbell weather vane behind Sora, to the clear green "water" that Jack is standing in, these statues have as much detail crammed in them as a McFarlane figure! There are even detail BEHIND the figures! 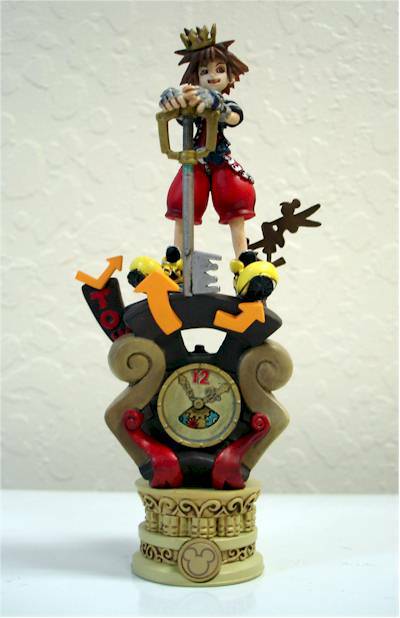 If SquareEnix would release these statues in a larger scale (like a 2-up), they would sell-out quite fast. The paint wash on these figures is very well done. No slop and a good attention to detail. Each individual link of Soras' belt chain is painted. So are the buckles on his shoes and his belt! The paint wash on all the statues bring out the details just like it should. 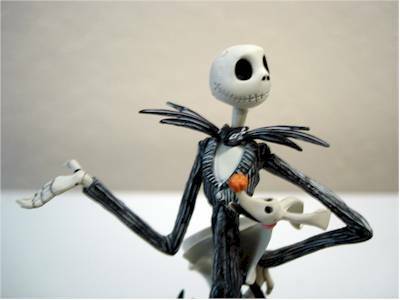 The only paint issue I can see is in the striping of Jack's outfit. It has a bit of slop between a few lines. But considering how small Jack is... I can overlook it. None. They are miniature statues. 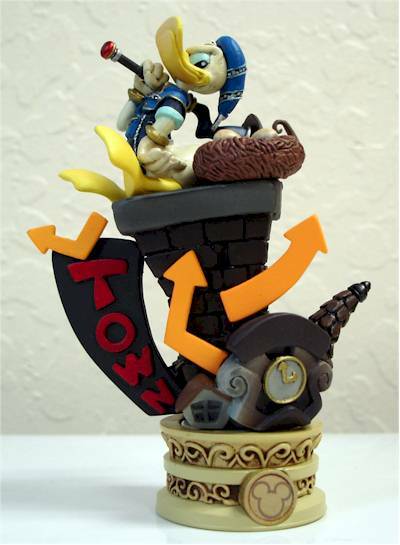 As a big fan of Kingdom Hearts, I think these are fantastic! Disney & Final Fantasy fans are going to love these. NOTE: because these statues have "sharp points" I would not advise giving them to young children! 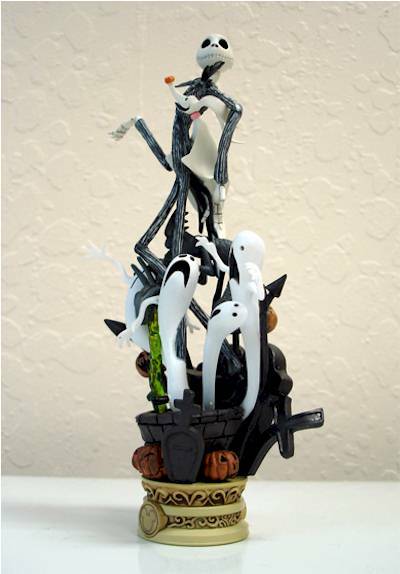 The original Japanese KH blind box statues range from $12.00 to $20.00. Keep in mind that they are imported AND you would have no idea what figure you are getting. These blister-packed statues from Diamond Comics should run from around $12.99 each. The comic shop where I found these had each one priced differently! 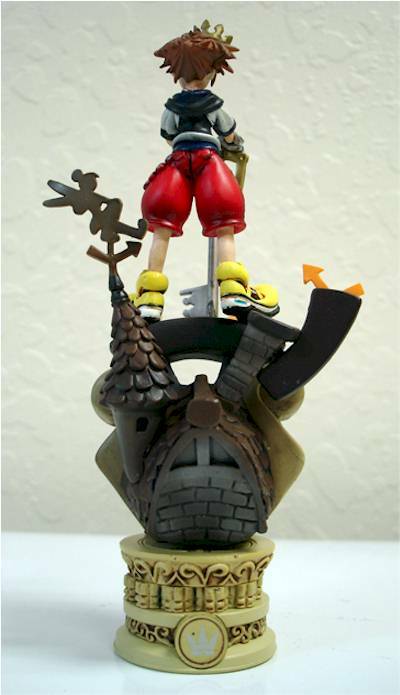 Sora was $12.99. Donald was $15.99. Jack was $17.99! I knew that a case was evenly packed, so I talked to the clerk and she told me that the owner must have priced the others higher because they are "more popular". But I'm happy to report that she sold me all three for $12.99. Be careful where you shop for these. They should all be the same price. Other than the small paint slop on Jack's jacket... nothing. I gotta say, I love these things. They are like a little piece of art. I hope that they sell well. There are 3 other figures from series 1 for Diamond to release. 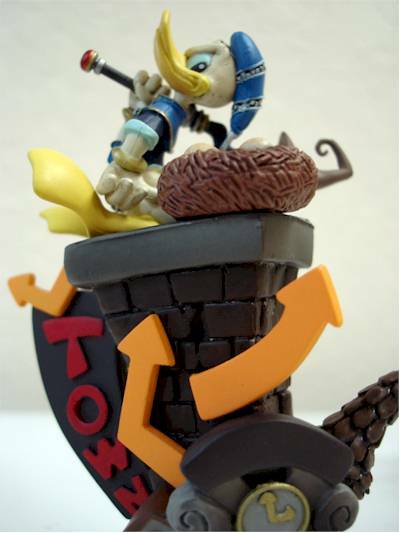 AND series 2 of the Japanese trading figures will be out in a few months. Here's hoping Diamond decided to bring these to the US as well. Right now the only place to get these is your local comic shop. Online vendors should have these as well. There is a English version site for the game, as well as the official Japanese site. KEEP SCROLLING DOWN FOR A LOT MORE PHOTOS! Figure from the collection of mintoncard.